In survey after survey, Singapore’s schools come up tops in international rankings of educational achievement. The success is usually ascribed to a culture of high educational aspiration and a system of close ability tracking. What is less well-known is the fallout from such intense social expectations and competitive school environments. At the tender age of 12, primary school students sit for a high-stakes national examination that determines their entry into different ability tracks, or streams, in secondary school: Express, Normal (Academic) and Normal (Technical). Acclaimed playwright Faith Ng has now trained her sights, and her keen ear, on the school system by bringing two Normal Stream students and their teacher to life on the stage. “Ashley and Daphne are Secondary 5 Normal Academic students struggling to cope with the expectations of their parents, the demands of society, and their own self-imposed standards. 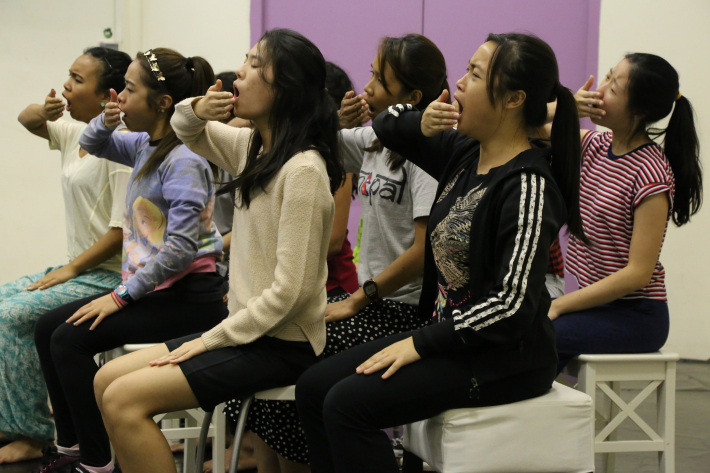 Can their new teacher, the idealistic Sarah Hew, find a way to help them?” This production of Checkpoint Theatre, directed by Claire Wong, will run from 9 – 19 April, in Singapore’s Drama Centre Black Box. Tickets are available from Sistic. Singapore Poetry asks Faith Ng a few questions about the new play and her dramaturgy. SP. Congratulations on the production of your new play Normal! As a former teacher in the Singapore educational system, I am so glad that finally the experience of so-called Normal Stream students will find representation on stage. I understand that the play is inspired by your personal experience and observation. Would you share something of that experience? What is included, changed or left out in order to craft that experience into the dramatic form of a play? FN. There are many triggers that prompted me to write this play—all of them personal. One was a silly fight I had with my husband, who had carelessly and innocently referred to something I did as “stupid”. I experienced this sudden consuming surge of indignation and rage, which frightened me. It made me realise that I was still carrying a lot of baggage as an ex-Normal Stream student; wrestling with the stigma and negative perceptions attached to it (by myself as much as those around me). Writing this play has been my way of exploring and making sense of my time in the education system. I’ve always drawn from personal experiences to write because they hold a sense of genuineness and personal truth, which I value greatly. However, I am also conscious of the powers fiction and storytelling have in mending the cracks and delving into possibilities that reality can’t. I try to merge them together in the hope of creating something deeper and stronger than my own experiences. I also interviewed many of my ex-classmates and ex-teachers, as well as current Normal students and teachers to get a more objective and wider view of the issues at hand. This gave me a deeper awareness of the frustrations of being a student as well as the difficulties of being a teacher. Their voices and thoughts helped to enrich my play. SP. You have just completed a creative writing residency with the University Scholars Program at the National University of Singapore (NUS). In an interview given to the program, you said that you were inspired to write on hearing actors speak “with this very strange, perfect, impeccable English that didn’t reflect the reality I truly lived in” in the plays that you watched as an NUS undergraduate. How do your plays–wo(men) (2010), For Better or for Worse (2013), and Normal (2015)–depict the different languages as spoken in Singapore? FN. In all my plays, I try to show that Singlish is not just a pidgin and ‘broken’ language used for slapstick humour by people who are uneducated and coarse. Singlish is also playful, inventive, and deeply poetic. It can express deep and complex thoughts and has the ability to draw people together on a very intimate and personal level as well as tear them apart. 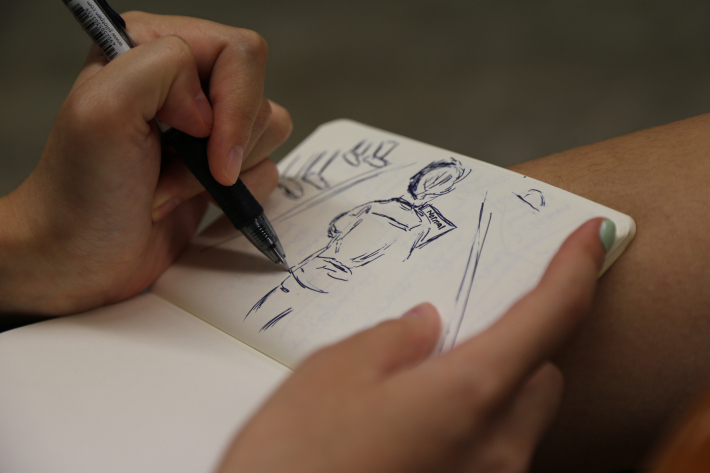 My first play, wo(men), is about three generations of women living together in a HDB flat. I wanted to explore the different languages spoken in a Singaporean Hokkien family—the grandmother speaks Hokkien, the mother speaks Hokkien and Singlish, and the daughter speaks Hokkien, Singlish and English— and our ability to switch between languages and registers based on our unique relationship to the other party (how close we are to them, what we want them to think of us, or whether we want them to understand what we are saying). I was also fascinated by how the languages you speak reveal your educational and personal background as well as shape the way you see the world. For Better or for Worse looks at the Singlish that middle-class Chinese Singaporeans speak and how we communicate or mis-communicate with each other. Gerald, one of the main characters, also uses Teochew to speak to his mother. This was inspired by the many times I watched my dad converse to my grandmother in Teochew; the fluid slip from the harder and clipped sounds of Singlish to the softer and sweeter sounds of Teochew showed a tenderer side to him. I find that the language we grow up with are sometimes able to communicate things that other languages might not. For Normal, I wanted to show the registers of English taught in schools and contrast that with the Singlish spoken by students and teachers. Take for example the Shakespearean English that we study in Literature. His work is commonly seen as a model of good, serious, and scholarly literature – which is something of a post-colonial hang-up – but we often forget Shakespeare’s mastery of language to explore class divides where the fool is often the wisest character. SP. Together with Lucas Ho, Joel Tan and Shiv Tandan, you belong to the very first group of associate artists with Checkpoint Theatre, headed by Huzir Sulaiman and Claire Wong. Could you describe what is involved in being an associate artist? How has your association with the company influenced your development as a writer? FN. Checkpoint Theatre has been really instrumental in strengthening my voice as a writer as well as in giving me the confidence and the advice necessary to continue my writing career. Just being with the Checkpoint Theatre team – surrounded by people who are distinctive and talented artists in their own right – has been such a blessing, because it lets me know that I am not alone. We talk openly to each other about our explorations, questions, concerns, and fears, and artistic dreams. We also share our creative ideas with each other, and everyone chips in in such an unselfish and compassionate manner to improve these ideas further. SP. Who is your favorite non-Singaporean playwright? What draws you to his or her plays? FN. Malaysian writer Leow Puay Tin. I love the ways she plays with language—they are a wonderful clatter of dialects and various languages—and the way she experiments with form. She understands that humour and solemnity are not enemies. Most importantly, she is a writer who is not afraid of her roots, showcasing and exploring them simultaneously. SP. What advice would you give to an aspiring playwright? Would the advice be different for an Express Stream and a Normal Stream student? FN. Read widely; read books you normally wouldn’t read. This will expand your scope and interests as a writer. Watch as many plays as you can. Seeing the various possibilities of theatre will allow you to dream wildly of many others. Find ways to make writing an enjoyable and immediate part of your everyday life. Staring at a blank word document on your laptop can be daunting and uninspiring. Take a walk and let the story play out in your head as though it is a movie (feel free to pause, rewind, repeat, or change certain parts), type down random story ideas on your phone when you have a spare moment in between appointments, or draw a picture of what your character looks like to get a different perspective on who he/she is. My advice for Express and Normal stream students is the same. We all experience the pains of being labelled or left out. The streaming system in secondary schools is just one instance of something that happens everywhere. My hope is that we will be able to summon greater compassion and empathy in recognising each other as people first, people who have their own stories and struggles, and who sometimes fail and sometimes succeed. Faith Ng is a playwright and an Associate Artist with Checkpoint Theatre. She also teaches playwriting at the National University of Singapore. Her plays include wo(men) (2010) and For Better Or For Worse (2013), which were both nominated for ‘Best Original Script’ at the Life! Theatre Awards, organised by Singapore’s national broadsheet, The Straits Times. She holds a Master of Arts with Distinction in Creative Writing (Scriptwriting) from the University of East Anglia, under the National Arts Council Postgraduate Scholarship.